I have been making scratch biscuits for years and this recipe is probably one of the best recipes I’ve ever used that starts out with a store-bought baking mix (prefer Bisquick or Pioneer). I tried this recipe a couple years ago and it was OK but the dough was so wet that the biscuits really didn’t look as pretty. So I decided to try one more time and found this recipe which recommends adding a half a cup of your baking mix to the board or mat you dump the dough out on. Then I rolled around the dough in the baking mix and worked it a minute or two, just until it came together. The dough is still a wet dough, but by using that extra half a cup of baking mix it makes it the perfect consistency. I made the recipe pretty much exactly as it is written. The only thing I did different was really more to do with a preference instead of any kind of change to the recipe. I cut the sour cream in with a couple of table knives and used a fork to mix the 7-Up into that mixture. I did use a 9 inch round cake pan. But when I finished working the dough, I patted it out then divided it into 10 equal pieces of dough by hand, no cutter. This is something I’ve always done when I made my scratch biscuits. Then I rolled each piece of dough in my hand for a couple of seconds till they were smooth and rounded out a bit, then place them in the pan with the melted butter evenly spaced out. Once they were all in the pan I took my hand and pressed the balls of dough down a bit until each biscuit was touching each other on the sides. The biscuits will not come out perfectly round, but to me that’s what makes the biscuit homemade, that they are not all exactly perfectly round biscuits. This is the way my grandmother did it as well. She very rarely ever rolled out biscuit dough. The taste and texture of these biscuits will remind you of a fluffy buttermilk biscuit. One last thing, maybe just my oven, but I found 425° at about 13 to 14 minutes was perfect. Will be using this recipe over and over. 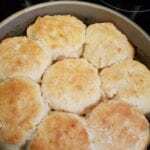 This is the best/easiest recipe for biscuits I have ever used! I have never been able to make a biscuit that weren’t hard as a rock until now. Everyone loves my biscuits. Just made these biscuits. I am 73 yrs. old and my biscuits have always been like hockey pucks. My MIL made homemade bread, pies, cakes, etc. My husband just said best biscuits he’s ever eaten. And they were. What I did wrong….I burnt my butter and had to start over. I didn’t put bisquick on my hands and they were a sticky mess. I read where someone added 1/2 tsp. of baking soda. That is the only change I made. I’m doing cartwheels……and that’s not easy at my age. LOL. One question….is it better to flash freeze before or after baking. We like to travel in our RV and I need these in my freezer. USE THE NEXT PAGE LINK BELOW FOR THE RECIPE AND INGREDIENTS.